Amazon Cognito invokes this trigger to initiate the custom authentication flow. The request contains session, which is an array containing all of the challenges that are presented to the user in the authentication process that is underway, along with the corresponding result. 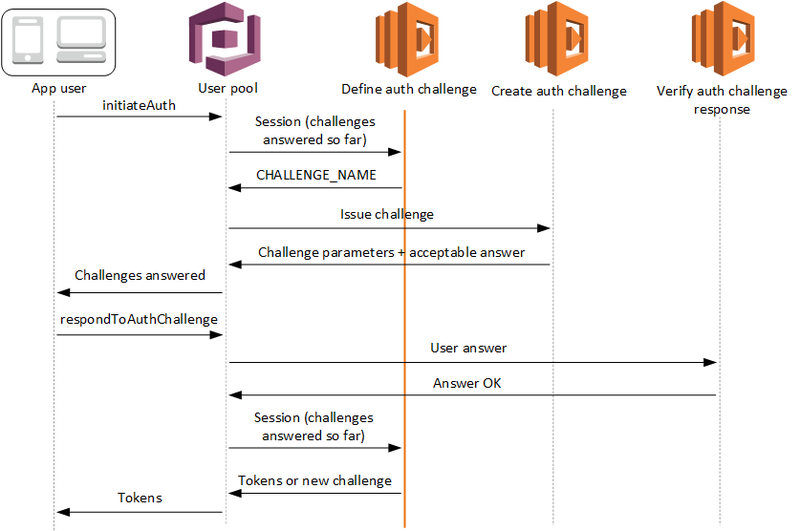 The challenge details (ChallengeResult) are stored in chronological order in the session array, with session representing the first challenge that is presented to the user. In the response, you can return the next stage of the authentication process. A string containing the name of the next challenge. If you want to present a new challenge to your user, specify the challenge name here. Set to true if you determine that the user has sufficiently authenticated by completing the challenges, or false otherwise. Set to true if you want to terminate the current authentication process, or false otherwise.